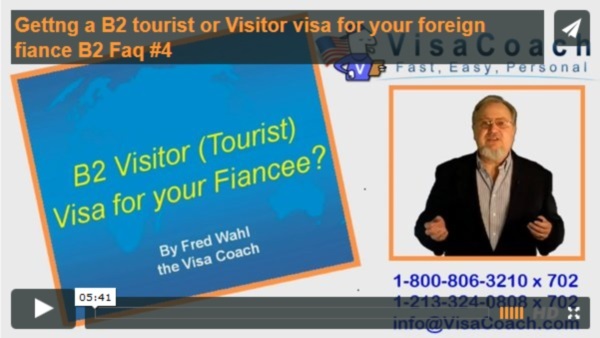 Obtaining a Visitor Visa for your Fiance: Avoid spoiling her chances? "I met this great gal online. She lives on the other side of the world. we haven't met in-person yet. I want to meet her face to face." don't travel well, too expensive, she should come to me, ...."
There is no such thing as a "girlfriend" visa. The closest alternatives are a B2 Visitor visa (sometimes called a tourist visa) or a K1 Fiance Visa. But a fiancee visa requires that the couple has already met in-person, and not only that but that they are serious and want to marry. Often the guys most eager to pursue a visitor visa, aren't quite ready to commit. This leaves the B-2 Visitor visa. The good news: Applying for the B-2 visa only costs $160, and in a short month or two you have your answer. The bad news: To be approved, the consular officer must be convinced there is NO POSSIBLE CHANCE your fiance would overstay, or in any way attempt to remain in the USA permanently. Maybe it is not yet on YOUR mind, but guaranteed, your Fiancee IS thinking of a possible life together with you in the USA. Her "intent to eventually live in the USA" in practice makes her officially ineligible for the visitor visa. Most consulate officers response at the end of the interview would be "Sorry, you applied for the wrong visa. The fiance visa is the one appropriate for your situation. You should apply for that one instead. Work out the eligibility requirements with your boyfriend, then apply for the K-1 fiance visa. I will see you here again at the end of that process"
Even though the Visitor Visa is very likely to be denied, many couples apply anyway, in hopes of winning the lottery. Some, Win the Lottery and get their visa. It depends on the consular officer. If you follow the rules, you have got nothing to lose by applying for a B2 visitor visa. Being denied for a visitor visa, because she "applied for the WRONG visa" should not hurt her chances for any future visas. She must be very careful to ALWAYS tell the truth. Everything she says is placed into her immigration record. If she is ever caught making fraudulent statements to a consular officer, that may result in her being banned from getting ANY visa to the USA, FOREVER. Where the temptation to lie is greatest, is when she is asked: "What is the purpose of your trip?" , "Who do you know in the USA?" or "Who is paying for your trip?" Why are you traveling to the USA? If the truthful response is. My Boyfriend, My Boyfriend, My Boyfriend she better say exactly that. When dealing with immigration, always tell the truth. Don't volunteer information, but always provide honest answers. If the answer truly is "my boyfriend" or "my fiance", then that is exactly what MUST be said. In the majority of cases, she will most likely be denied the visitor visa. But if honest, approved or denied, it won't hurt her chances for the fiance visa. (especially when I am there to coach the couple to success). HOWEVER, if caught lying to US immigration, even if it was for something as trivial as applying for a visitor visa, the likelihood chances of being approved for the LIFE-CHANGING fiance or spouse visa will be damaged. 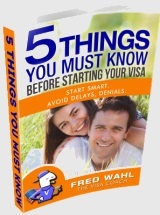 Don't expect a happy outcome if while being interviewed for a visitor visa she denys knowing you, then a short few months later, in front of the same consular officer she changes the story to tell him you have been in a serious relationlship for years. .
Get your FREE copy of 5 Things you MUST KNOW before STARTING your Fiance visa application Start Smart. Avoid Delays and Denials. Increase your chances for visa approval, PLUS free updates and immigration news via our monthly Fiancee Visa Secrets newsletter. VisaCoach® is a U.S. Patent & Trademark Office Registered Trademark #86412256. 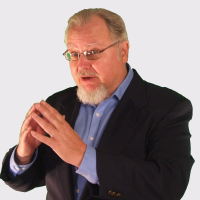 Fred Wahl is Bonded by the State of California as an Immigration Consultant, qualified to coach in the non-legal, technical procedures of immigration form preparation, and document selection. Whenever legal advice or legal representation is needed, the service of a qualified Immigration Attorney should be sought. 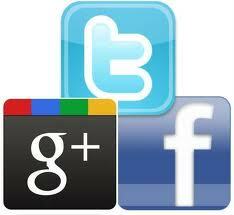 Access to and use of VisaCoach.com and Services are subject to the VisaCoach terms of service.